The default ordering is most recently added first. The Metrics Toolkit provides evidence-based information about research metrics across disciplines, including how each metric is calculated, where you can find it, and how each should (and should not) be applied. You’ll also find examples of how to use metrics in grant applications, CVs, and promotion dossiers. There are two ways to use the Toolkit. Explore metrics to quickly look up the metrics you want to learn more about, by name. Or you can choose metrics that are best for your unique use case by filtering based on the broad discipline, research output, and desired impact. This how-to guide is a step-by-step guide to the Directory of Open Access journals application, created specifically for library publishers by the 2017-18 Library Publishing Coalition DOAJ Task Force. The task force was charged by the Library Publishing Coalition to evaluate the needs of the LPC community related to the Directory of Open Access Journals (DOAJ), mentor LPC member institutions through the DOAJ application process, and recommend any necessary ongoing support. This how-to guide is the major written resource we have created for member institutions. Did you know that there are more than 25,000 biomedical journals? The number of scientific journals continues to increase rapidly1. Given this situation, it is perhaps not surprising to learn that many authors have a difficult time deciding where to submit their manuscript for publication. There are many factors that may play a role in your decision of where to submit your manuscript. Have you recently written a paper, but you’re not sure to which journal you should submit it? Or maybe you want to find relevant articles to cite in your paper? Or are you an editor, and do you need to find reviewers for a particular paper? Jane can help! Just enter the title and/or abstract of the paper in the box, and click on ‘Find journals’, ‘Find authors’ or ‘Find Articles’. Jane will then compare your document to millions of documents in PubMed to find the best matching journals, authors or articles. Instead of using a title or abstract, you can also search using a keyword search, similar to popular web search engines. Click here to search using keywords. JANE relies on the data in PubMed, which can contain papers from predatory journals, and therefore these journals can appear in JANE’s results. To help identify high-quality journals, JANE now tags journals that are currently indexed in MEDLINE, and open access journals approved by the Directory of Open Access Journals (DOAJ). is relevant and useful to academics faced with making decisions about publishing. FOSTER Plus developed a set of ten free online courses covering key topics of Open Science. Each course takes about one hour to complete and a badge is awarded after successful completion. You will need to create a free account on the FOSTER portal if you wish to claim your badge but the courses can also be accessed without registration if no badge is desired. The order you take the courses in is not important, the system tracks your progress regardless and you can claim the badge as soon you completed each of the suggested courses. However, we recommend starting with “What is Open Science?” as an introduction. The draft courses were released for public consultation during the summer and have been refined based on community feedback. The Educopia Institute empowers collaborative communities to create, share, and preserve knowledge. Issued by the Educopia Institute in November 2018, this publication provides a powerful lens that can provide both emerging and established communities with ways to understand, evaluate, and plan their own growth, change, and maturation. Why Open Research? Advance your career by sharing your work. This project was born out of our passion for opening up research, making it accessible and reusable by all. We view access to information as a human right and think it should be treated as such. And we believe it will take students and researchers at all levels of academia to bring about culture change. By sharing our work, we can stimulate learning, innovation, and discovery. Many researchers support the idea of increasing access to research, but worry about the implications for their career of sharing their work. We built this site primarily for researchers, to educate them about all the different ways they can be open and how sharing can be beneficial for their careers. We also aim to provide information and resources for those working in open advocacy. All resources herein all openly licensed and their reuse in encouraged. Schimmer, R., Geschuhn, K. K., & Vogler, A. (2015). Disrupting the subscription journals’ business model for the necessary large-scale transformation to open access. doi:10.17617/1.3. This paper makes the strong, fact-based case for a large-scale transformation of the current corpus of scientific subscription journals to an open access business model. The existing journals, with their well-tested functionalities, should be retained and developed to meet the demands of 21st century research, while the underlying payment streams undergo a major restructuring. There is sufficient momentum for this decisive push towards open access publishing. The diverse existing initiatives must be coordinated so as to converge on this clear goal. The international nature of research implies that this transformation will be achieved on a truly global scale only through a consensus of the world’s most eminent research organizations. All the indications are that the money already invested in the research publishing system is sufficient to enable a transformation that will be sustainable for the future. There needs to be a shared understanding that the money currently locked in the journal subscription system must be withdrawn and re-purposed for open access publishing services. The current library acquisition budgets are the ultimate reservoir for enabling the transformation without financial or other risks. 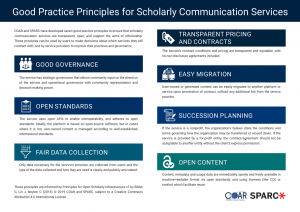 The goal is to preserve the established service levels provided by publishers that are still requested by researchers, while redefining and reorganizing the necessary payment streams. By disrupting the underlying business model, the viability of journal publishing can be preserved and put on a solid footing for the scholarly developments of the future.